ARE YOU SURE YOU’RE SAVED? On this bright but breezy Sunday afternoon I was out walking when I saw a woman sitting on a granite block (of which there are many in New England) beneath some trees in a park. At first I walked on by but then I heard a ‘still small voice’ tell me to go back and hand her a tract. So I went back to where she sat and asked if I could give her something as I reached out to hand her a tract. She thanked me and asked if I was Born Again, to which I answered “Yes.” Are you? I asked. She answered in the affirmative adding that she was kind of in a bad place right now and didn’t like getting close to people. I didn’t ask why, maybe because I was in high spirits and didn’t care to hear anything negative. For some reason however, I listened to her pour out her story for the next forty minutes or so. She began by telling that she didn’t attend church anymore, and had a strict religious upbringing by an abusive father whom she more or less, despised. She further expressed she was tired of Christians who say that God ‘allows’ suffering and we just have to accept it without questioning. Then she said she had given up questioning God about things as she felt she hadn’t gotten any answers. After dropping those bombshells on me, she asserted that we couldn’t really know or understand God, or make any sense out of our experiences, so it was useless to try. I’m pretty sure that line of reasoning didn’t originate with her but came from someplace else, perhaps from an ancient belief system called Deism. Deism is the belief that God is distant, unknowable, and impersonal; a god who doesn’t get involved in or intervene in human affairs. It means we’re basically on our own, left to fend for, and figure things out for ourselves. Could one call it Abandonment Theology? Another belief system that’s been around awhile is Existentialism, which basically asserts that man exists for his own sake, unencumbered by the restraints of religious dogma and demands of a righteous God because there is NO God. In other words, ‘do- your- own- thing’ because there’s no purpose to life outside of pleasing yourself and fulfilling your desires. Make no mistake about it, these belief systems were inspired by ancient demonic SPIRITS who still roam the earth, seeking whom they may devour! [1 Pet 5:8] They’ll devour the lukewarm, the misinformed, the deceived, and those who love their lives in this world more than they love God. [Jn 12:25] They might be influencing your thoughts even though you don’t realize it. Further into our conversation the woman said that although she was ‘open to God,’ she wasn’t convinced that the New Testament scriptures were inspired of God since men wrote them fifty years after Christ’s death and resurrection. She reasoned that since she can’t remember what she said only yesterday, how could the disciples recall with any accuracy, what they’d heard and seen fifty, a hundred, or two-hundred years after the resurrection of Christ? This is a perfect example of how human intellect can get in the way of knowing God. So I asked her, “What would convince you that they’re inspired?” She replied, “Nothing on this earth!” Have to admit, I stood there in stunned disbelief at this supposed believer’s unbelief. There’s nothing quite as disturbing as a believer’s unbelief. Near the end of our brief encounter, I felt there wasn’t much more I could say to her because she really was not open to the Truth. Her final remark to me was, “You’re entitled to your opinion.” Wow that felt like an insult, since I had spent a good chunk of time listening to her and speaking God’s truth to her. I didn’t take offense realizing that she was just trying to defend her unbelief by labeling God’s Word as merely men’s opinions! To reinforce her stance, she added that everything we hear from anyone is just their opinion which you either believe or you don’t. She was wrong as the Holy Spirit still speaks through God’s servants . People having her mindset can’t truly believe in ANYTHING, as it leaves them with NOTHING but a joyless, meaningless existence. How can one have joy who believes that life has no meaning and God is strict, distant, and uncaring, which she alluded to by saying how God allows suffering but does nothing about it. Truth is, God HAS done something about it. He sent His only begotten Son to die for men’s sins, bearing their griefs and sorrows [Isaiah 53]. But the truth can’t set you free if you don’t believe it. Despite claims of being ‘open to God,’ her doubts about the reliability of His Word told a different story. It’s questionable how one so FULL OF DOUBT could be Born Again, but if true, she was definitely having difficulty in her relationship with the Lord. Believers have dry periods where they find it hard to sense God’s presence, pray, and worship. There are also times when doubts assail them but those moments should be short-lived. Persistent doubt and unbelief can lead to spiritual barrenness, drought, and spiritual death. When you have a vital personal relationship with God, you’re FULL OF THE JOY OF THE LORD. This woman had NO joy; her face was sullen and her eyes were dull. Believer’s faces SHINE from reflecting God’s glory [Exo 34:29]. The more I thought about these things, I began wondering if she had just pretended to be a believer in order to engage me in a debate. One tactic of the devil is to place people in your path who’ll speak disparaging words to try to discourage you in your faith, and or, plant doubts in your heart about God’s goodness. Isn’t that how the Devil tricked Eve into eating the Forbidden fruit? This encounter reminded me that not all who say they’re Born Again really are. Many sincerely think they are, but their words and actions don’t line up with the Truth. The proof is in the fruit, and we’re told to “try the spirits” as well [1 Jn 4:1]. A truly Born Again (born from above by the Spirit of God) person will bear the “fruit of the Spirit” in their lives which is Love, Joy, Peace, Patience, Kindness, Goodness, Gentleness, Meekness (humility) and Self-Control [Gals 5:22-23]. The woman I met in the park, displayed a good deal of intellectual pride (instead of trust), and stubborn resistance to all my efforts to share biblical truth with her. It’s also possible for one who has been Born Again, to FALL AWAY. This is where the woman could be headed in my estimation. “For it is impossible for those who were once enlightened, and have tasted of the heavenly gift, and were made partakers of the Holy Ghost, If they shall fall away, to renew them again unto repentance…” [Heb 6:4-6] In the end of days the Bible prophesies there will be a “great falling away” [2 Thes 2:3]. Doubting God’s Word and His goodness, is a treacherous, slippery slope that can lead you into Apostasy and spiritual death. As the woman and I walked out of the park together, she stopped to look at the river and spotted a seagull laying motionless in the mud at the river’s edge about twenty feet from us. Its wings were only half open, and it moved just its head. 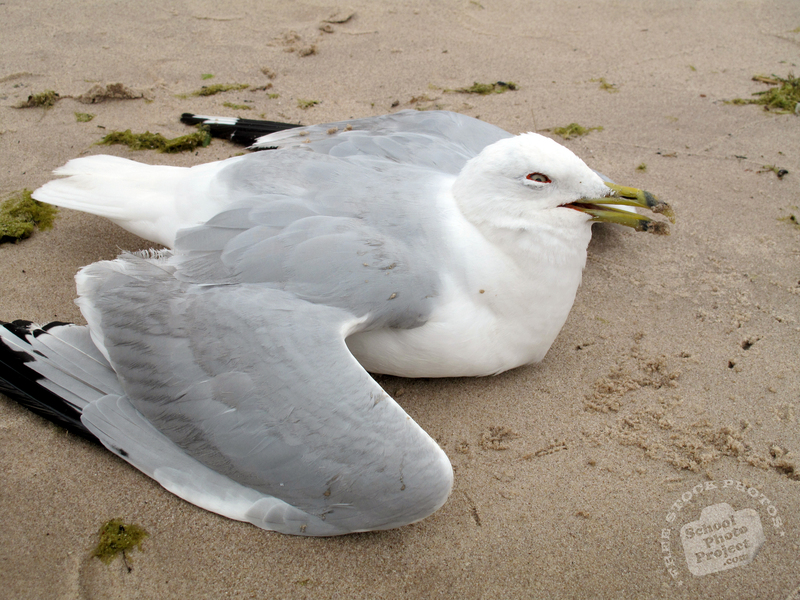 The woman commented that the gull was “dying.” She also pointed out some little fish that were swimming around in the water, but I saw none. At the moment I didn’t think much about it, but later the thought occurred to me that maybe the gull and absence of wildlife around it, could be prophetic signs of the woman’s spiritual condition. I had sensed a substantial amount of heaviness and gloominess about her which could be a sign of spiritual oppression. What’s certain is that her mixing of philosophy with Christian faith, and her over-intellectualizing is dangerous to the health of her faith and soul. Dear reader, WATCH your words and thoughts to be sure you’re not mixing your faith with the vain philosophies of men which can DESTROY your faith in God and the Bible! Col 2:8 Beware lest any man spoil you through philosophy and vain deceit, after the tradition of men, after the rudiments of the world, and not after Christ. When you’re born anew you begin a new life that’s joined to the spirit of God who’ll never leave you, and will guide you constantly if you let him. So, who’s it going to be? Who are you going to serve; yourself, the Devil, or God? It’s the most important decision you’ll ever make in your life so give it lots of thought, counting the cost. Yes, there IS a cost to being one of Christ’s disciples, so make no frivolous or shallow commitment to Him for He hates ‘lukewarmness.’ [Rev 3:16] He wants fully surrendered, zealous believers who’ll lavish their love and worship on Him, and are willing to lose their lives for His sake. [Mk 8:35] Despite the costs of following Jesus, the benefits FAR outweigh them! In the Bible are thousands of wonderful promises for those who faithfully love and serve Him. How do I know that God cares about human suffering? I know because I’ve spent lots of time getting to know Him through studying His Word and by praying and listening to Him. How do I know that His Word is trustworthy and reliable? I know because I have TESTED it. I have STOOD on God’s Word many times when I was all alone raising a severely disabled child, and it was ALL I HAD to get me through long, anxious nights. Plus, it is written, 2Ti 3:16 All scripture is given by inspiration of God and is profitable for doctrine, for reproof, for correction, for instruction in righteousness, that the man of God may be perfect, thoroughly furnished unto all good works. I’ve PROVEN God’s Word true by applying it over and over in various circumstances, and found it to be as SOLID as granite! Looking back, I can see how not always having human help available CAUSED me to lean hard on God and His Word, which made my faith STRONG. It wasn’t easy, but learning to trust His Word paid huge dividends for me in the short, and long run. Not that I never make mistakes, but they’re way less often and not catastrophic ones like they once were, due to having stored up so much of His Word in my heart. [Ps 119:11] You can do likewise and get the same good results, if you’re willing to trust and not give in to fear and doubt. Just remember, not deciding to serve Jesus Christ IS a decision to serve yourself and the Devil. At the moment of physical death your eternal future is sealed, there’ll be no second chances. If you choose to serve Satan, you’ll eat the bitter fruit of death in hell with him and other unrepentant sinners. Why not serve Christ, while you still can, and live with Him forever? https://www.gotquestions.org/deism.html “Deists deny the Trinity, the inspiration of the Bible, the deity of Christ, miracles, and any supernatural act of redemption or salvation. Deism pictures God as uncaring and uninvolved. “ https://en.wikipedia.org/wiki/Deism Deism (/ˈdiː.ɪzəm/ DEE-iz-əm or /ˈdeɪ.ɪzəm/DAY-iz-əm; derived from Latin “deus” meaning “god“) is a philosophical position which posits that a god does not interfere directly with the world. It also rejects revelation as a source of religious knowledge and asserts that reasonand observation of the natural world are sufficient to determine the existence of a single creator of the universe. www.urbandictionary.com/define.php?term=existentialism Existentialism in its purest form is any philosophy which states that existence precedes essence; that is to say, that there is no inherent purpose in life (though … http://www.philosophybasics.com/branch_existentialism.html Existentialism is a philosophy that emphasizes individual existence, freedom and choice. It is the view that humans define their own meaning in life, and try to make rational decisions despite existing in an irrational universe. It focuses on the question of human existence, and the feeling that there is no purpose or explanation at the core of existence. It holds that, as there is no God or any other transcendent force, the only way to counter this nothingness (and hence to find meaning in life) is by embracing existence. It’s disheartening so many believers are misinformed about the gifts of the Spirit which are just as valid and available to believers today as they were in the early Church period. The super-natural gifts given at Pentecost have NOT ceased, Cessationism is a lie, and a doctrine of Demons. Any questions re this or any other post, you can email at the address provided under “Contact Me” on my Home Page. Also, if you’re sure you’ve been Born Again yet you really struggle with feeling God’s presence, can’t worship or pray, and have little or no joy or peace in your heart, maybe it’s time to seek counsel. I have no counseling degree, but I have the Holy Spirit. So if you want to contact me via email, I’ll consult with you to see if there’s something I can do to help you. I’ll make myself available to the extent that I can, short-term. May Yahweh bless you.